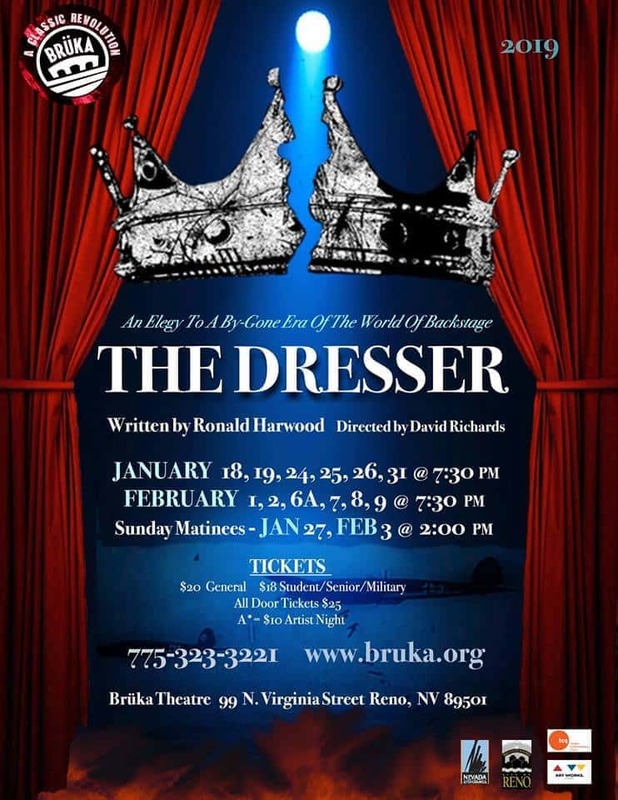 Bruka Theatre’s 26th Season: A Classic Revolution continues the season’s classic bend with The Dresser, written by Ronald Harwood and directed by Dave Richards. Originally produced in 1980 on The West End and Broadway, The Dresser is theatre based on the author’s experiences as dresser to an English Shakespearean actor. The actor, called Sir, is a vainglorious actor, the last of the great breed of English performers. The play begins with Sir in a “bad way”, as his dresser Norman tries valiantly to prepare him to go on stage as King Lear. Unsure of his lines as well as who and where he is supposed to be, Sir is adamantly determined to roar his last. This bracing, heartbreaking drama becomes a beautiful stand‐alone story for the redemptive nature of theatre. Playing January 18, 19, 24, 25, 26, 31 February 1, 2, 6A, 7, 8, 9 with matinees on January 27 and February 3, 2019. All Brüka mainstage evening shows now begin at a new time: 7:30 PM. Matinees begin at 2:00 PM. Doors open ½ before curtain time. Brüka was named “Best Local Theatre Company” by The Reno News & Review for the 21st year in a row. Visit our Bruka Bazaar downstairs for gifts and unique items. PRICES: General admission: $20. Admission for Students/Seniors/Military: $18. All tickets are $25 at the door. RESERVATIONS are available in person through the Brüka Box Office (775) 323-3221, online at www.bruka.org or at the Melting Pot World Emporium @ their location: 1049 S. Virginia Street, Reno. Our box office is open Wednesday through Saturday afternoons. We are closed on most holidays. Our Season Tickets are on holiday special now. Online tickets available: http://www.brownpapertickets.com. LOCATION AND PARKING Brüka Theatre is located at the corner of First and Virginia Streets in downtown Reno next to the Virginia Street Bridge. We validate convenient parking at the Parking Gallery on First and Sierra Street. We highly suggest parking in the Court Street parking lot across from The Pioneer Theater after 5:00 PM and weekends and walking across the new Virginia Street Bridge to Brüka. ABOUT BRÜKA THEATRE Now celebrating its 26th season in downtown Reno, Brüka has been named “Best Theatre Company” by Reno News and Review 21 years running. Brüka Theatre is a leader in the region, recognized for its innovative productions, exceptionally talented artists and acclaimed Theatre for Children series since its founding in 1992. Central to Brüka is the commitment to the re-investigation of contemporary and classic plays and developing new plays within Brüka’s Artistic Collective, a group that includes winners of the Nevada Arts Council and Sierra Arts Foundation artist grants and ten local best actor honors. Brüka is a non-equity, small professional, not-for-profit member theater company of the national TCG (Theatre Communications Group). Brüka Theatre has produced over 100 shows in our downtown Reno location. Sign up for our newsletter by going to our website at www.bruka.org.